Today is March 14th, so that makes it Pi Day! For those of you who do not know what Pi is, an explanation follows. If you do know, however, then you don’t have to read on, you can just go back to solving your quadratic equations with an abacus. 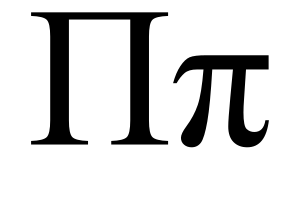 Pi or π – which looks a lot like a Hebrew letter, a table or Prince’s name when he wanted to be a symbol – is actually the Latin name of this Greek letter and is pronounced “pie”. So how does that Greek letter become part of modern day mathematics (the keeners always ask me this question), well it might be because “π” is the first letter of the Greek word περίμετρος which translated to English means perimeter. The ratio of the perimeter to the diameter, is constant for all circles, so if it never changes old world scholars thought it must have a Greek or Latin name, hence Pi. Pi Day is celebrated on March 14th at 1:59am if you are on a 24 hour clock, or 1:59pm if not. π is an irrational number, its decimal representation does not repeat, and therefore does not terminate. This has fascinated mathematicians and regular people like you and I for year, as we try to recite Pi to as many decimal places that we can remember. The Guinness Book of World Records record for remembered digits of π is 67,890 digits, held by Lu Chao, a 24-year-old graduate student from China. It only took him 24 hours and 4 minutes to recite π to the 67,890th decimal place without an error. For those of you not celebrating the math-kind of Pi day today, you might be looking to celebrate a different kind of pie day today since today is also one month after Valentine’s Day so today is also Steak and a BJ Day. Unfortunately, I saw this too late to celebrate… We have no steak in the house. Previous Post It was a deja vu on Friday… First cat pee, then rotten fish and chicken. UGH. Next Post Beware the Ides of March! What the heck does that mean anyways? I’ll tell you! No pie either. I’m on diet.